Adam West was at the pinnacle of pop culture in the 1960s; he was a good-natured actor synonymous with the Caped Crusader role in the popular superhero TV series Batman. After three high-flying years as the star of the spoofy 1960’s classic series, the iconic star whose fame rivaled that of James Bond and The Beatles struggled to escape his alter ego in the later part of his career. Here’s all you need to know about the legendary Batman actor who remained a darling of his fans even after his glory days. The ardent actor was born William West Anderson on September 19, 1928, in Walla Walla, Washington. He was raised and educated in Washington and graduated with a degree in English literature from Whitman College. Adam was later drafted into the US Army where he worked for the American Forces Network. After his stint in the Army, he settled in Hawaii, where his acting career began. What Is Adam West Famous For? While in Hollywood, he changed his name to Adam West. He made his feature film debut with a minor role in the 1959 drama The Young Philadelphians. In the years that followed, he played supporting roles on the small screen, notably as Detective Sergeant Steve Nelson in hit series The Detectives (1961-62), and as Cleander in the historical TV series, Alexander the Great. Some of his notable roles on the silver screen include: a cavalry officer in Geronimo (1962), an astronaut in Robinson Crusoe on Mars (1964), a straight man in The Outlaws is Coming (1965), and a Texas Ranger in The Relentless Four (1965). West’s big break came in 1966 when he landed the role of Batman in the comic crime fighter ABC series. During the popular television phenomenon that lasted till 1968, West alternated between the superhero and his alter ego, Bruce Wayne. However, after his stint on the show ended, West fell victim to typecasting and his career suffered. His Batman character inhibited him from getting other major roles. Though he continued to act on television and in films, as well as worked on voice-overs, his high-flying career gradually flamed out. Throughout his life, he still continued to work and reprise his role as Batman in several animated shows and TV specials. Notably, he portrayed Batman/Bruce Wayne in the 1977 project The New Adventures of Batman, in SuperFriends: The Legendary Super Powers Show (1984) and The Super Powers Team: Galactic Guardians (1985). 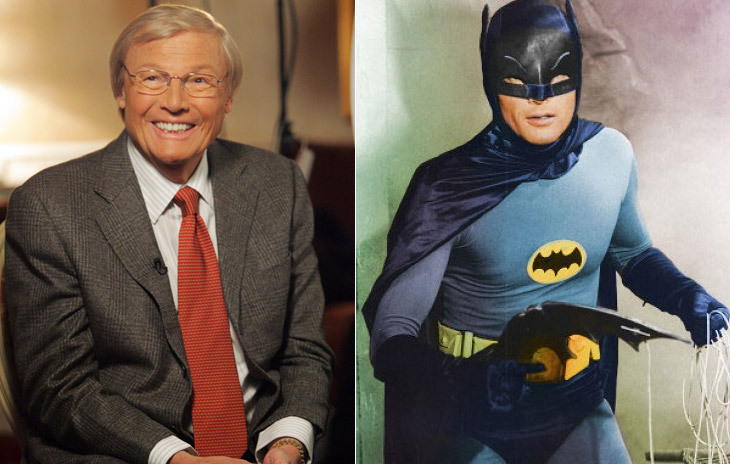 Among younger fans, Adam West is popularly known for voicing the hilarious Mayor West of Quahog on the Fox animated sitcom Family Guy, and as Ace in Chicken Little (2005). His other recent works before death were: The Drew Carey Show (1995 to 2004), The King of Queens (1998-2007), 30 Rock (2006-2003), the animated Batman: Return of the Caped Crusaders (2016) and The Big Bang Theory (2017). From portraying eccentric or psychotically delusional characters both on TV and in films, Adam West had a successful career that spanned seven decades. In his lifetime, he amassed an estimated net worth of $8 million, most of which was earned from his acting career. In April 2012, West was honored with a star on the Hollywood Walk of Fame. He left a legacy in the world of pop culture as the comedic legend who made Batman hilarious with all his laughs and smiles. Before, during and after the popular series, there were speculations as to whether Batman and Robin were gay. But West is known to have been sexually straight as evidenced in his relationship and marriage history. 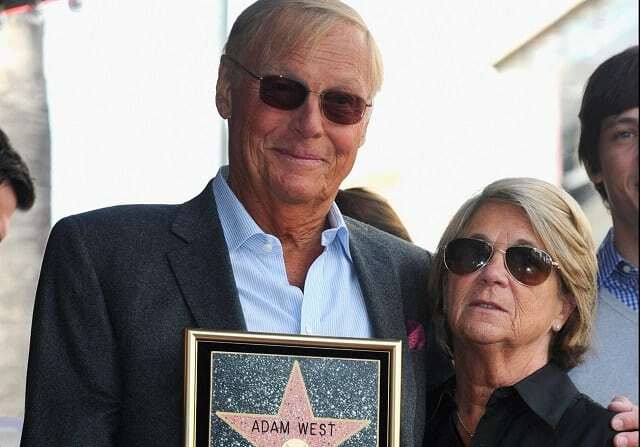 Adam West was married three times. His first marriage was to Billie Lou Yeager in 1950 while he was in his last year at college; they got divorced in 1956. Next, he married Nga Frisbie Dawson, a Tahitian woman, with whom he had a son and daughter. However, the marriage also ended in a divorce in 1962. He was married for the third time to Marcelle Tagand Lear in 1972. West and Marcelle remained married until the actor’s death. They had two children together and were also parents to the kids they each had from their previous marriages. The legendary actor died on 9 June 2017, in Los Angeles after a brief battle with leukemia. He died at the age of 88 and left behind his wife, six children, five grandchildren and two great-grandchildren. West and his wife spent most of his later days at their ranch near Sun Valley, Idaho, where he retreated to since the mid-1980s. The actor’s body was cremated and his ashes sprinkled at the Pacific Ocean.